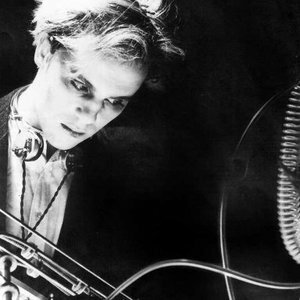 Thomas Dolby (born Thomas Morgan Robertson; 14 October 1958 - London, UK) is an English musician and producer. He is one of the great legends of electronic music. His career as a solo artist includes two of the most unique and recognizable hits of the genre, She Blinded Me With Science and Hyperactive!. Dolby promoted himself as a kind of mad scientist, an egghead that had successfully harnessed the power of synthesizers and samplers, using them to make catchy pop and electro-funk. Dolby promoted himself as a kind of mad scientist, an egghead that had successfully harnessed the power of synthesizers and samplers, using them to make catchy pop and electro-funk. Before he launched his solo career, Dolby had already notched up a mouth-watering catalogue of cred as a studio musician, technician, and songwriter; after starting out as a teenaged live sound man mixing The Fall, The Members and others using a PA he built himself, he formed the arty post-punk band Camera Club (also known as Bruce Woolley & The Camera Club) with Bruce Woolley, Geoff Downes, Trevor Horn and Matthew Seligman. Within a year, he had left the group and joined Lene Lovich's backing band and gave her his song New Toy, which became a British hit in 1981. That same year, he released his first solo single, Urges, on the English independent label Armageddon. By the autumn, he had signed with Parlophone and released Europa and the Pirate Twins, which nearly cracked the UK Top 40. Dolby started playing synthesizer on sessions for other artists in 1982. That year, he played keyboards on def leppard's Pyromania and joan armatrading's Walk Under Ladders. His most distinctive session credit is that keyboard line after the chorus on foreigner's Waiting For A Girl Like You. In that eventful summer Dolby also collaborating with New York rappers whodini to create Magic's Wand ? a pivotal early hip hop track (the first rap single to shift 1 million copies), and it also single-handedly started the new jack swing movement. Even with all of these achievements, 1982 was most noteworthy for the release of Dolby's first solo album, the golden age of wireless, in the summer of 1982; this landmark album reached number 13. windpower, the first single from the record, became his first Top 40 UK hit in the late summer. Other cuts from the album include the epic airwaves, and one of our submarines is a stunning meditation on the futility of empire. ?The red light flickers, sonar weak / Air valve hissing open / Half her pressure blown away / Flounder in the ocean / See the Winter Boys / Drinking heavy water from a stone.? In January of 1983, Dolby released an EP, Blinded By Science, which included what would become his most well-known track, She Blinded Me With Science featuring a cameo vocal appearance by the notorious British eccentric Magnus Pike, who also appeared in the song's video. She Blinded Me With Science was a minor hit in England, but the EP and the single became a major American hit in 1983, thanks to mtv's heavy airplay of the She Blinded Me with Science video. Eventually, the song reached number five on the US charts and it was included on a resequenced and reissued version of The Golden Age Of Wireless, which peaked at number 13 in America. the flat earth, Dolby's second album, appeared in early 1984, and harkens back to a time when songs mattered more than the video, even as MTV was discovering its strength. Opening with Dissidents, conjuring up images of blacklisted authors and ugly snow, gray from oppression, with Matthew Seligman's bass at the fore, lavish, growling, popping through octaves, funk-a-fied and twinkling with harmonics throughout the album. The title track is an R&B daydream of piano and Motown stabs of rhythm guitar. screen kiss has a similarly ethereal quality, and the lyrics are lush with imagery. The cover of dan hicks' 1967 I Scare Myself is a balmy jazz club cocktail ? faithfully nostalgic, right down to a bittersweet trombone solo from Peter Thomas. hyperactive is, and always was, one part bizarre to two parts infectious; guest vocalist Adele Bertei fuels the fire to what was already destined to be a memorable diversion beyond the reach of Top 40. The single became Thomas' biggest UK hit, peaking at number 17.
aliens ate my buick, Dolby's long-delayed third album, appeared in 1988 to a mixed reaction, although Airhead became a minor British hit. That same year, Dolby married actress Kathleen Beller. For the rest of the late 80s and early 90s, Dolby continued to score films, producing and he began building his own computer equipment. 1992's astronauts and heretics, featured guest stars such as eddie van halen, jerry garcia, bob weir and ofra haza. The album opened with I Love You Goodbye, one of Thomas' most evocative songs, and ended with Beauty Of A Dream which is also a contender for that honour. Highlights found inbetween include Cruel (a duet with Fairground Attraction's Eddie Reader), I Live In A Suitcase and Close But No Cigar. The following year, Dolby founded the computer software company Headspace in Silicon Valley, releasing The Virtual String Quartet as its first program, and also pioneered technology for music on mobile phones. For the rest of the 90s, Headspace occupied most of Dolby's time and energy. In 1994, he released The Gate To The Mind's Eye, a soundtrack to the animated short film Mind's Eye. Also that year, Capitol released the greatest-hits collection, Retrospectacle. Thirteen years after astronauts and heretics, Dolby returned to live performance in 2006 with his solo Sole Inhabitant tour, which covered North America and the UK, with Thomas recreating the highlights of his earlier work from scratch, with a camera mounted like a miner's lamp on his head, and a big screen showing the view from the artist, turning what would be a fairly dull one-man-and-a-rack-of-synths into a fascinating audio visual experience and an unintended masterclass for music technology students. UK indie label Invisible Hands Music released a CD and DVD box set recorded on the Sole Inhabitant tour. These fresh and modern reinterpretations of Thomas' work to date precedes a new studio album due in 2008, which is as-yet untitled, but does include a song about Britney's ex kevin federline (?K-Fed?) who used an uncleared sample from she blinded me with science and did not respond to legal approaches until a ?cease-and-desist' was posted in the comments field of his MySpace page. That song is called My Karma Hit Your Dogma, and bodes well for a mighty return to form, combining Thomas' humour and intelligence with a unique musical vision. 2011 saw Dolby get busy by returning with a new studio CD a map of the floating city on 29 October. The album is broken down into three genres of Urbanoia's tales of city experiences; Amerikana as Dolby's take on his years living in America and it's roots music; and Oceanea: songs of life by the sea in his home country of England. The music was debuted first as download EPs to Dolby's online community and then previewed by a transmedia interactive game also called the FloatingCity.com. Thomas Dolby is taking the music back on tour as a solo artist and with varying line-ups of bands, doing 2 tours of the UK in 2011, and has his first trip to Australia in February 2012 followed by dates in Japan. In March Dolby kicks off the Time-Capsule.tv tour at the SxSW Festival in Austin playing dates in USA and Canada through April. He will have a trailer parked at venues on his tour where you can produce a 30 second video offering words of wisdom to whoever will be walking the earth in the future. Dolby wants to give people a chance to ?explain to an alien visitor what went wrong with our civilization. Our species may not be around on this planet much longer, so you might as well leave a welcome message for the next guys.? Always provocative ideas and music from Thomas Dolby.